In the early days of the industrial revolution in the 19th century, large factories and mills had machinery that made an incredibly loud noise for the whole of the 13-hour working day. Factory workers were forced to learn how to read lips to be able to talk to each other, a skill that came in useful when the long exposure to the dangerous noise levels make them deaf. Today, noise problems in the workplace can still cause deafness in developing countries, or in those without regulations. However, Europe, the USA and Australia have stringent rules about just how much noise workers can be exposed to to protect them from hearing damage. Internationally agreed regulations have set the danger level for noise at 85 decibels. Exposure to sound that is louder than this is known to cause permanent hearing damage. The louder the sound, the less time required to cause problems. Being close to a very loud explosion can instantly damage hearing. Health and Safety experts advise people should not be exposed to noise over 105 decibels for longer than 2 minutes at a time. How Does Damage To Hearing Occur? Noise damages ears because of the way sounds are detected inside the inner ear. Sound is basically changes in air pressure – loud sounds create more pressure differences than quiet sounds. The changes in pressure are picked up as vibrations by tiny, very sensitive hairs inside the cochlea of the inner ear. Very large vibrations can rip these hairs to pieces and once they have been destroyed, they cannot grow again. Scarring of the cells that supported the hairs often occurs, leading to sound distortion and false sounds. This is why tinnitus – a ringing sound in the ears – often occurs after exposure to very loud noise. Experts in health and safety at work can be called in by employers to monitor noise levels in work environments using sound level meters. These are able to pick up the pressure caused by sound waves in the air and convert this to a reading in decibels, allowing the noise level to be assessed constantly. The meters are portable, so can be placed at different positions in the workplace to measure the maximum sound level. Officers can provide guidance to employers on how to reduce noise production by making modifications to the noise-producing machinery. Often they suggest moving the machines away from workers, or housing it in a soundproof room if this is possible. For some businesses, it may be possible to rearrange the working day so that the heavy machinery runs are carried out at times outside the normal working day when the factory is fully staffed. 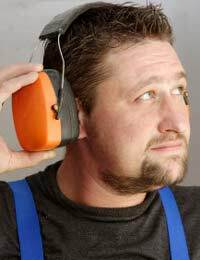 People who need to work with machinery that is producing sound over the danger threshold level should be given ear protection to place in or over the ear, or both, to minimise the sound that actually reaches the ear drum. Workers should be allowed regular breaks away from the areas where the noise is loudest, so they are not exposed to dangerous levels for prolonged periods. Many employers arrange for free hearing tests for the people who work for them, so that any problems can be picked up as soon as possible. The inability to pick up high frequency sounds is one of the first indications that something is wrong. Any loss of hearing is irreversible and workers need to be protected more effectively if there are signs of early hearing loss. Anyone working in a noisy environment needs to protect their own hearing, not just leave it completely up to their employer. Make sure you always wear the ear protection provided and take advantage of breaks offered from the noise. Take seriously any signs that hearing damage is becoming a problem. If you have tinnitus – ringing in the ears – at any time, you need to see a GP and arrange for a hearing assessment straight away.